Just like with the hedgehog, I surface crocheted all of the fun fur so it’s very easy. Several of you mentioned having some difficulty in the past with seeing your stitches while working with fun fur. 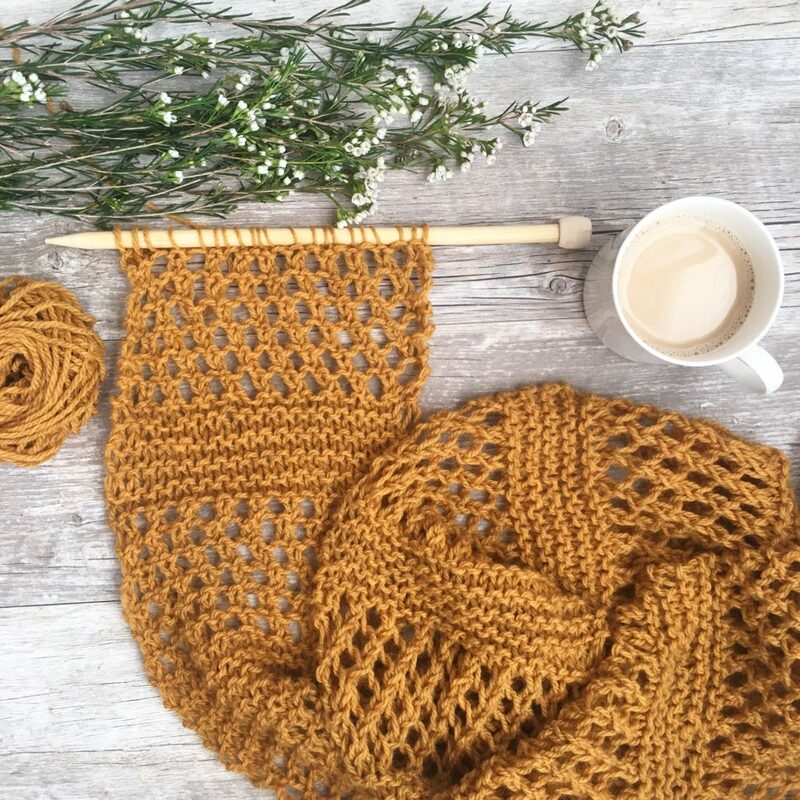 This won’t be an issue if you’ve had trouble as you will just surface crochet and you don’t even have to be precise. It’s very forgiving! 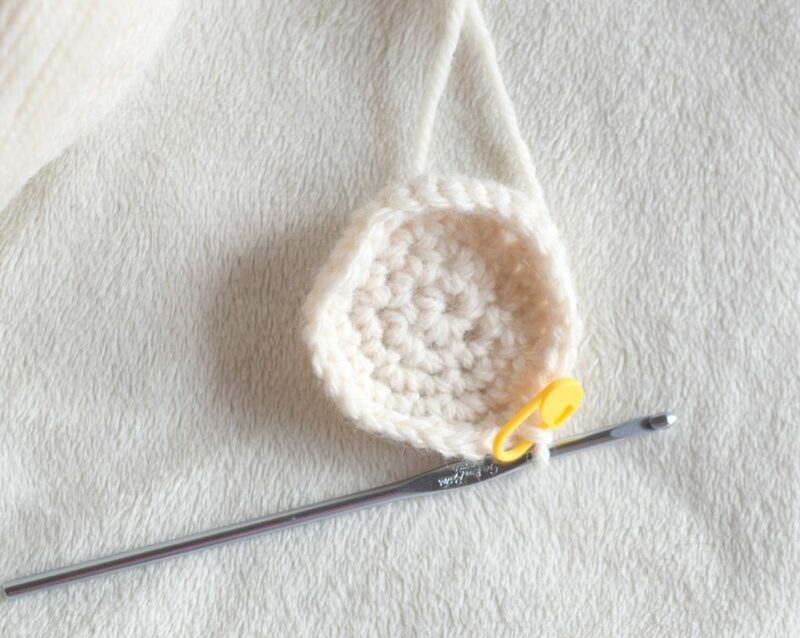 For the owl, you should know how to single crochet and be able to crochet in the round. There are also some basic increases and decreases in the pattern. You will mark your rounds, and will work in continuous rounds. 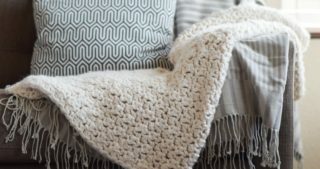 If you’ve never surface single crocheted, it is simply crocheting along the surface of the fabric. This is what I did with the fun fur and it’s a really easy way to add details to your projects. I’m listing what I used to make the owl below, but you can make this owl your own by changing up the colors. 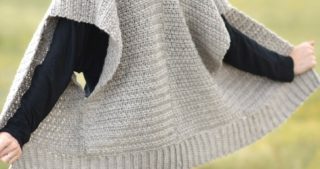 It’s also a great project to use up some scrap worsted weight yarn that you might have laying around. It doesn’t take much yarn at all as it only used about half a skein or less of the Lion Brand Wool Ease. 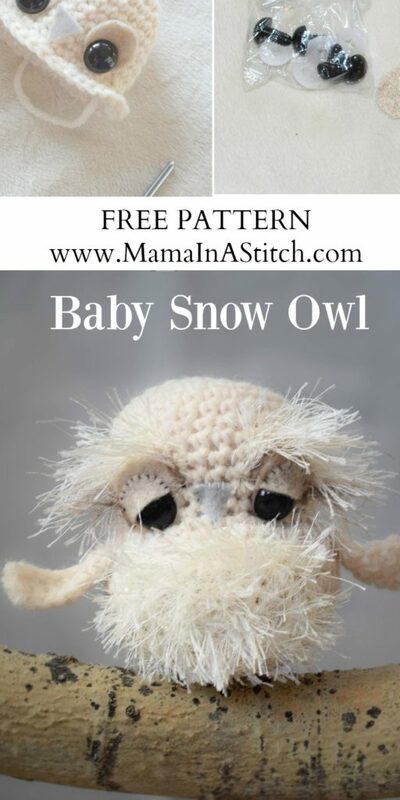 I liked this yarn in particular for the owl because of the texture and the off white color. I didn’t want him to be too bright white and this was the perfect match. At any point now, you can attach the eyes and nose. (See instructions for each below) You can also begin to fill the head with the stuffing. 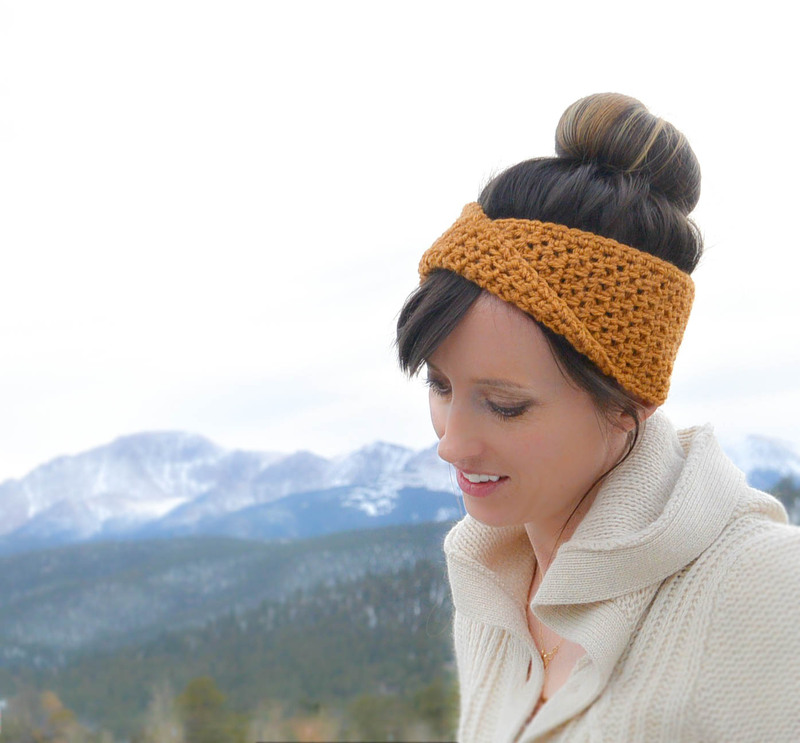 The little owl will get prettier as you go! Round 24 Sc in each stitch around – make sure she is stuffed as much as possible now! Attach each wing to the sides of the body, just below the increase rows (or about halfway down the side of the body-see picture). 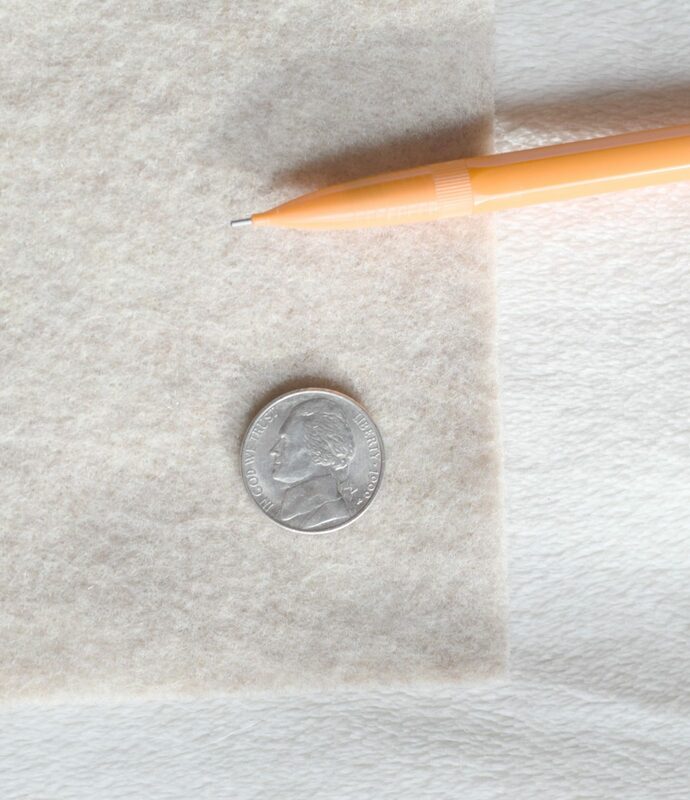 Cut out two pieces of felt about the size of a nickel (or a little over 3/4″inch diameter). Cut or poke a small hole 1/3 of the way up from the bottom. This hole is where you will insert the safety eye. Insert the safety eye through the hole in the felt and then insert the piece 2 rows above where the increasing begins (basically at the bottom of her head, each eye should be placed so that there are approximately 7 stitches in between the eyes). Secure with the fastener. 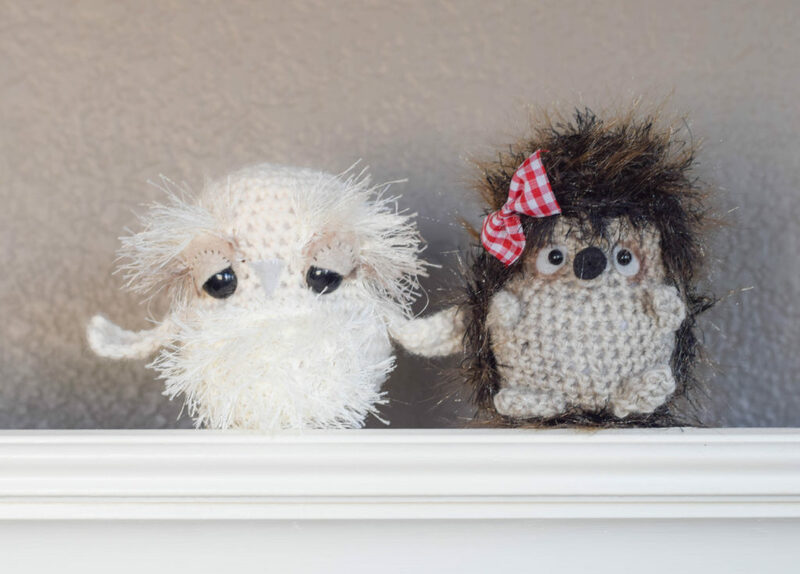 I used the same method that for the eyes that I did with the hedgehog which I found from Stephanie at All About Ami HERE. This pulls the eyes inward a bit to make them more life like. This of course is optional, but I really like the effect that it gives the eyes. Cut a third circle out that is the same size as the other felt circles, about the size of a nickel or 3/4″ inch in diameter. Cut this circle in half. Each of these halves will be eyelids. Place them over the upper portion of the black safety eyes. With your needle and thread ( I used brown thread), stitch around the eyelid with a whip stitch to attach. 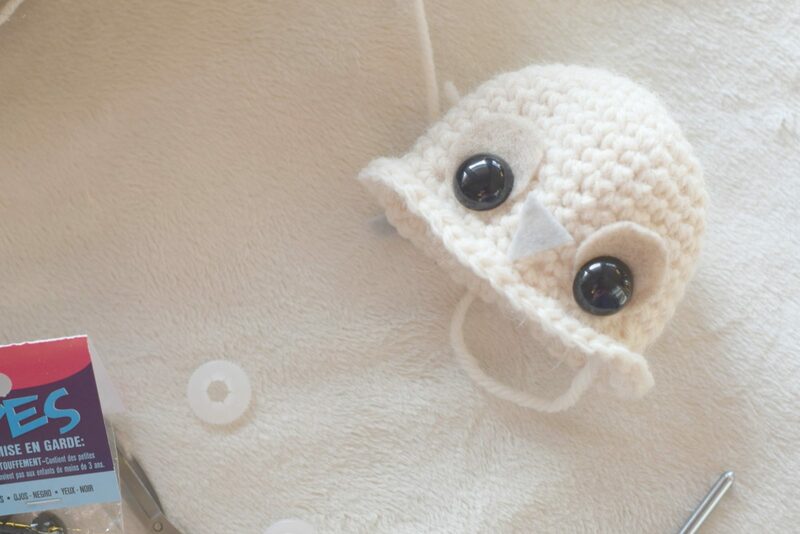 Baby snow owl is coming along. I think she might be cute without the fun fur as well. 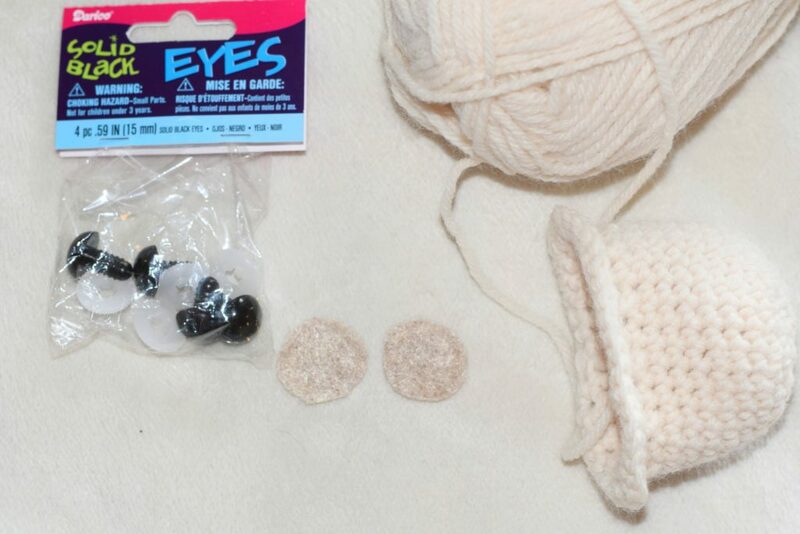 This is how I tied the eyes to make them more life like. I found this method on All About Ami. With your grey felt, or whatever color that you have chosen for the beak, cut out a small triangle. The base should be 1/2″ wide and the length from the base to the corner end of the beak should be 1/2″ long. Attach the beak with your sewing needle and thread in between the two eyes. See the picture if you need a visual on where to place it. I used the white thread to attach the beak. 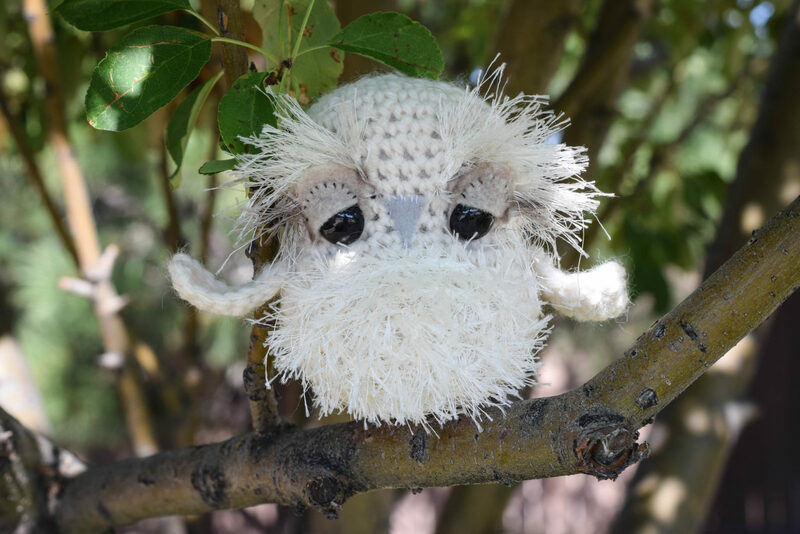 With your fun fur, surface single crochet the belly of the owl. You will attach your fur the outer edge of the owl’s “belly”. Don’t worry, this doesn’t have to be precise. It’s very forgiving! 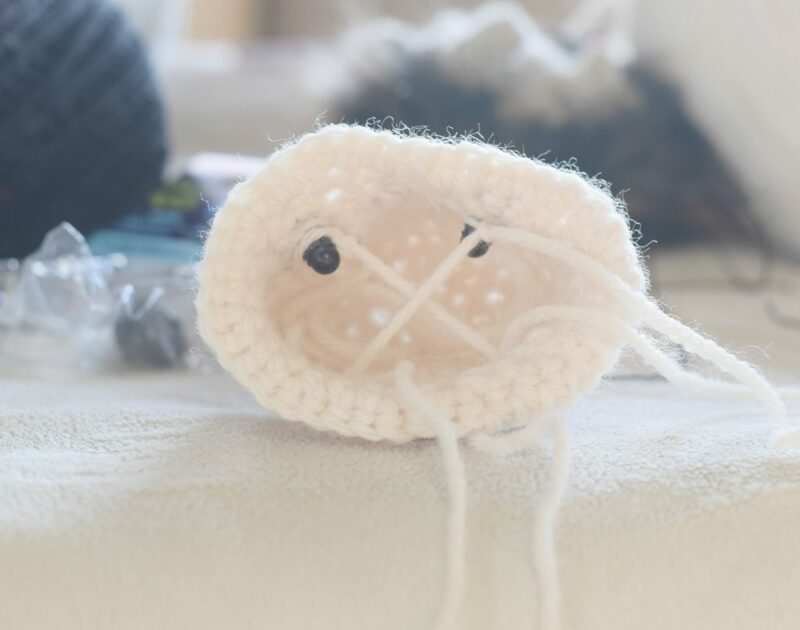 Single crochet along the surface in the shape of a large circle all around the belly. Fill in the belly stitches in this manner as well. I worked in a spiral, starting from the outside, making a circle and then going in to fill in the feathers, working around until I got to the center. I used scissors and gave the feathers a “hair cut”. Trim them down, and especially trim them near the eyes so they don’t block the owl’s view. 🙂 Done! Add some fur in the same manner, by surface single crocheting, just above his eyes. Start at the upper right side of the eye and surface single crochet around the the opposite lower, outside portion of the eye. Turn and do one more row, working back to the upper inside portion of the eye. Tie off, and trim as wanted. I added a little bit of brown eye shadow just to the outer corners of the eyes and the outer “feathers”. Feel free to share a picture if you make one with me on my Facebook page or Instagram and please let me know if you have any questions! Thanks friends! 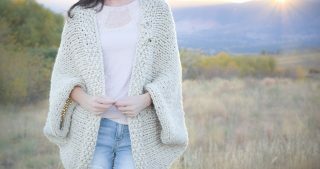 And thank you to Lion Brand Yarn for sponsoring this post! All opinions are 100% my own. Absolutely adorable!!! Love your woodland animal collection! Thanks my friend Patty! Stay cool down there in the heat! I am so happy to see this! Snowy owls are my LOVE! Have one as a tattoo. I have loved owls forever. I made your hedgehog and was never so pleased with something I have made before. Thank you for this wonderful adventure of making these! 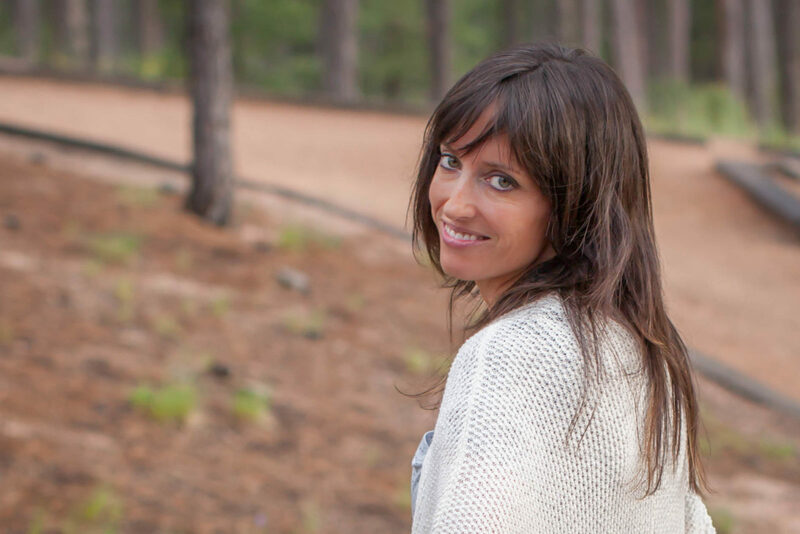 I’m so happy to hear this Kelly! How cool that you’ve even got a little owl tattoo. I’m so pleased that you love how the hedgehog came out. It really made my morning! Thanks for taking the time to write. And you’re welcome of course! I hope your daughter loves them! Let me know if you have any questions as you make them. So happy you think they are cute! So adorable! The eyes are perfect! 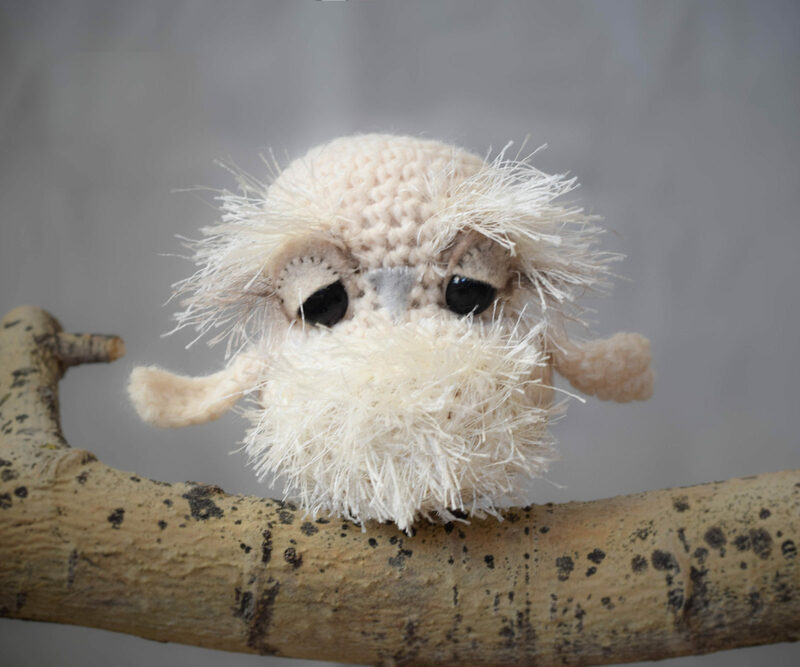 I often feel like my crocheted animals need something “more” around the eye area . . . this owl though! So great! I’ll check it out. Thanks so much for stopping by and for the kind words about the eyes! So adorable! Ben Wigler from Lion Brand gave me this link on my blog and I’m glad he did. I love owls and this one is the cutest. I’ll have to try this! Thanks! Hi Rula! How nice of Ben to share!! I hope you enjoy it. Owls are just so cute aren’t they?? I LOVE this snow owl. Now I want the hedgehog pattern. 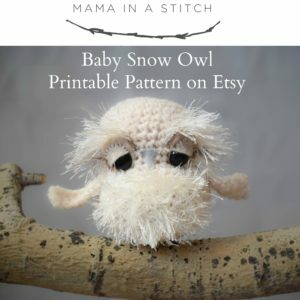 My grand-daughter is in love with owls and I have to make this for her. Thanks so much for the pattern. I just subscribed to your newsletter also. I’m having a terrible time trying to figure out “surface crocheting” with the fun fir. Do you have a quick tutorial to look at to get what you mean? Thank you very much. So sorry! I don’t have a tutorial for that. You want to put your hook through the first “hole or stitch” then out another to grab the fur and pull through to crochet. So hard to explain in detail…..hope this might help a bit!